Finally got some real sunflower field in my 2nd attempt. The first attempt was disaster after driving 350 miles, all I had got a few matured fields. But...Who cares now?? :) I finally got these lovely pics, one of my very first target since I came to Carolinas! Though it was not 100% satisfaction...Wanted to start my portraits with Devina & Dyuman , but who knew Dyuman is soooooo scared of honey bees, he din let his mom to pose, nor even himself. The one n only Devina's pic was actually with background music of Dyuman's loud yelling! Thank God my camera does not capture sound! Hope you enjoyed the beautiful flowers! 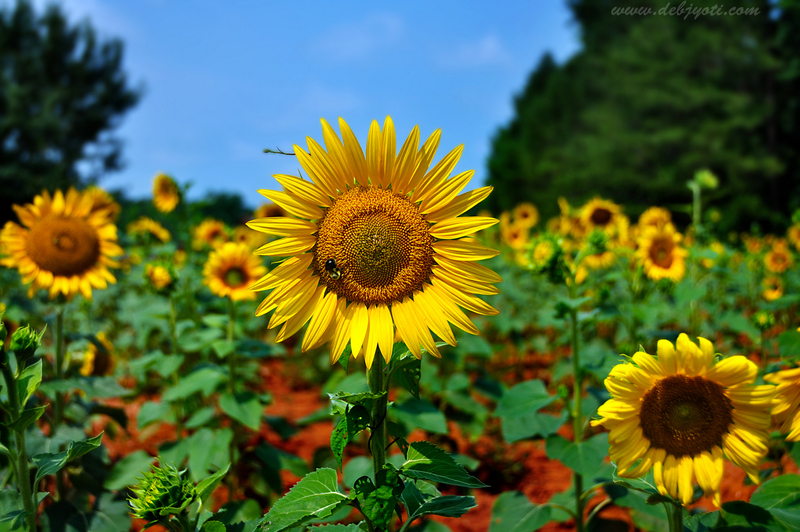 Can you tell me what makes sunflower different than other flowers? :) Comment here without googling!